In Ayurveda, each person has a natural constitution that determines their normal state and natural tendencies. These tendencies affect the skin, body, and mind. Understanding your skin's tendencies allows you to maintain its health by taking actions to keep your tendencies from becoming imbalanced. Each person has a unique constitution, and as a result, each person's skin is unique. Imbalances move you away from your skin’s natural state and lead to disharmony, symptoms, and disease. Most of the time, a person's natural tendencies (constitution) determines the type of imbalances that develop. But, this is not always true. Influences due to your natural tendencies, lifestyle, diet, and environment can lead to imbalances. Identifying these imbalances is essential to developing therapies that can correct them. Any imbalances are known as the Vikruti. Understanding your Vikruti allows for developing therapies, diet, and lifestyles changes that can help to correct the imbalances. The tables above show just a few of the many examples of how the three doshas (vata, pitta, and kapha) are important in describing the skin’s function and activity. This term represents the body’s “vitality,” or its ability to take on stress and resist the development of imbalances and disease. Simply put, those with high ojas can take on more stress while those with low ojas are easily moved out of balance. This can be thought of as the body’s defense mechanism and the ability to return to equilibrium. 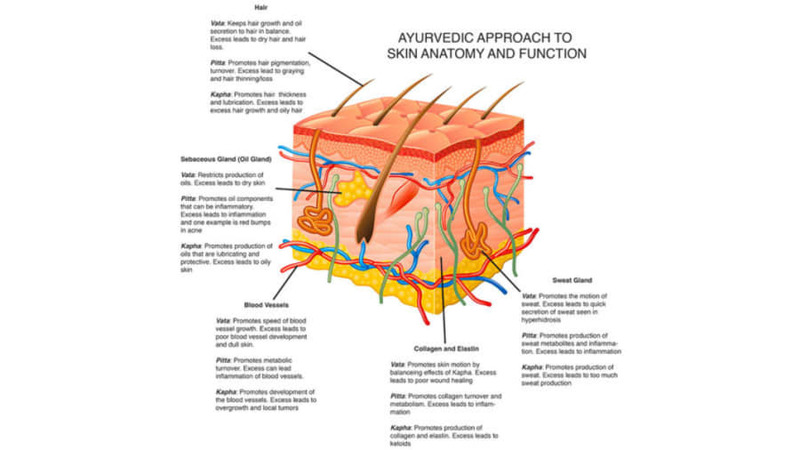 An example of ojas in the skin is its natural antioxidant ability to fight against oxidative stress. Those with more ojas tend to age more slowly. Things that increase kapha can also increase ojas as long as kapha is not excessive. Agni is the Sanskrit word for “fire,” and is the “fire” of digestion and metabolism. Those with low agni will digest food slowly, while those with high agni digest food quickly. In the skin, agni is important in maintaining the right balance between growth and breakdown, as the skin is constantly turning over and replenishing. When agni is too high, the skin can become dry and irritated. One example of this is in atopic dermatitis (a form of eczema) where the skin can become too inflamed, red, and dry. On the other hand, when agni is too low, there is not enough breakdown which leads to toxin buildup and excessive tissue. One example of this is a low functioning thyroid when the skin can become dull and doughy. Earth represents solidity and structure. 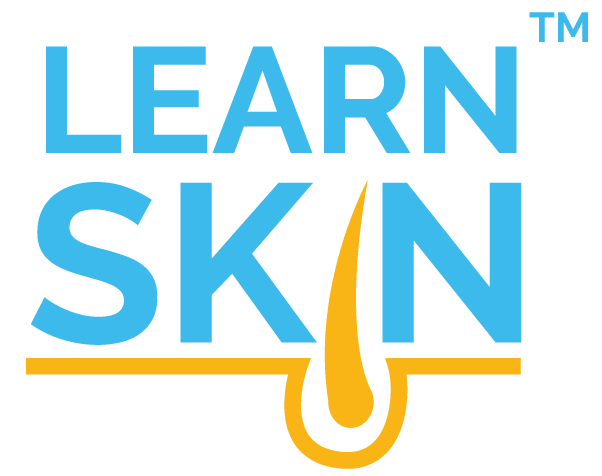 In the skin, it represents the structure of the skin, including the cells and the collagen that make it up. Water represents moisture and defense. The skin’s moisture depends on both the skin’s water and oil content. Water can absorb heat, and this element broadly refers to both the antioxidant and the anti-inflammatory properties in skin. Air represents both motion and the energy contained in its motion. In the skin, it represents the movement of cells, tissue, and nerve impulses. It is responsible for the sense of touch. Another example is the communication of nerves with the muscles to stimulate them to contract and move. Fire is the English word for "agni" which was described above. Fire represents light, heat, and metabolic transformation. Fire is the elemental force behind metabolism and the production of heat. In the skin, this represents the metabolic activity of the cells and the tissue. It also represents the heat, radiance, or inflammation of the skin. Ether represents space, emptiness, and randomness. For example, water in a cup fills the space in the cup. This space has no inherent character or qualities except that it is defined by emptiness. In the skin, either represents the space that is taken up by the skin. Ether is essential to understanding the Ayurvedic perspective on healthy tissue. When ether is present in a balanced amount, it allows for motion to take place. However, too much ether is seen in oxidative stress and aging. Things that increase the presence of ether lead to a loss of tissue structure and function. For example, oxidative stress can break down collagen and lead to collagen loss, which leads to thinner skin and wrinkles that are more commonly seen with skin aging. Vata is composed of a balance of Air and Ether. This balance is why vata represents motion and energy of the skin (due to air element) and the space needed in the skin for that motion (due to ether element). Pitta is composed of a balance of Fire and Water. The fire portion of pitta represents metabolism, heat, radiance, and inflammation. The water portion acts to keep the fire portion in balance due to its ability to take on the heat of pitta since it represents the body’s defense mechanisms. Kapha is composed of a balance of Earth and Water. This balance is why kapha represents the structure of the skin (due to the earth element) as well as its defense mechanisms (due to the water element).